Evan, Lucas, Daniel and David Marichal. 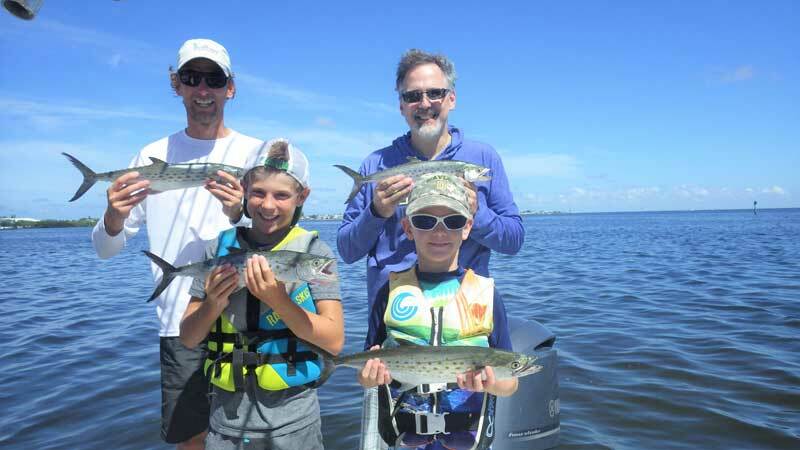 father, son and grand- sons from New Jersey, fished offshore Sept. 2 with Capt. Warren Girle. Using live shiners for bait, the group enticed plenty of action from a school of Spanish mackerel. Scarlett McGrath of Georgia, visiting grandparents Les and Mona McGrath of Mt. 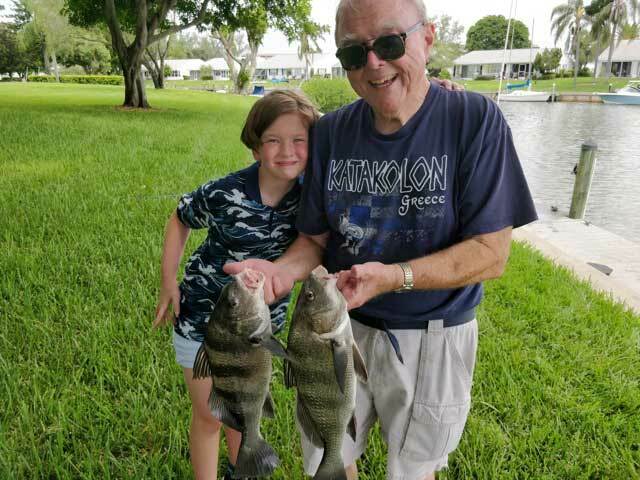 Vernon condos in Cortez, attracted two sheepshead to her hook Sept. 1 with live shrimp while fishing the canal that leads to Sarasota Bay. Fishing around anna maria island remains consis- tently good to the north. fishing tampa Bay and the Manatee River is yielding many species of fish — most of them readily taking the bait offered. Some likely fleeing red tide. 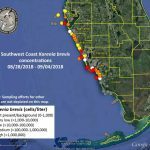 Speaking of red tide, i am hear- ing that things are clearing up. areas around Longboat pass and coquina Beach are showing signs of life again. as the red tide bloom dimin- ishes, we should see things return to normal in the weeks to come. Thanks to gordon for a big blow in the Gulf. Let’s keep our fingers crossed. Reports of ample bait fish in Longboat Pass is encouraging. i’m also hearing about snook in the surf at coquina and Whitney beaches. Back to fishing in Tampa Bay. Numerous species of fish are being caught — Spanish mackerel and mangrove snapper are taking the hook in good num- bers, especially around the Sunshine Skyway Bridge. 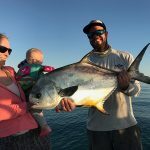 You’ll likely encounter bluefish, ladyfish and jack crevalle in these areas as well. Fishing shallower water around the flats of Terra Ceia and miguel bays is proving to be good. Snook and redfish — both catch-and-release for the time being — are being fairly cooperative. Spotted seatrout are taking the hook, too, but in the deeper grass areas. 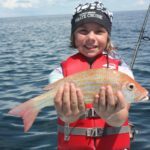 You can count on catching mangrove snapper on the deep grass, too. Capt. Jason Stock is working charters inshore throughout the flats of southern Tampa Bay. Target- ing redfish is proving to be good during morning low tides for his sportfishers. Casting live bait or artifi- cials into schooling reds is yielding a good fight with slot-size and over-slot size fish. Fishing mangrove edges or sandbars on the edge of the flat is a good way to locate these fish. While targeting reds, Stock is hooking into numerous snook. Also, fishing deeper water in the bay — deep grass or over structure — is resulting in Spanish mackerel, bluefish and sharks. Moving offshore, Stock is hooking into large permit around reefs and wrecks in the gulf of mexico. Capt. Aaron Lowman is catching his share of fish while in Tampa Bay. While dock fishing, Lowman is finding a variety of species, including redfish, snook, mangrove snapper and flounder. Jack crevalle and ladyfish are in these areas, too, especially where large schools of glass minnows exist. free-lining live shiners or adding a split shot to the rig is proving to be successful. Lowman says fishing structure in Tampa Bay is producing Spanish mackerel for his anglers. Jim Malfese at the Rod & Reel Pier is seeing clean water and no dead fish which means it’s time to venture out to the R&R and fish. Pier fishers using live shrimp as bait are hooking into mangrove snapper, flounder and an occasional redfish. Using larger baits — ladyfish or pinfish — is resulting in some over-slot snook. Finally, Spanish mackerel are being caught on small silver spoons or white jigs. Capt. Warren girle is working inshore with good results. fishing structure in tampa Bay is yielding Spanish mackerel and mangrove snapper, which are being taken with live shiners as bait. Fishing deep grass areas in tampa Bay is produc- ing spotted seatrout and bluefish. On shallower flats, Girle is leading his sportfishing clients to some lively hookups on snook and redfish.